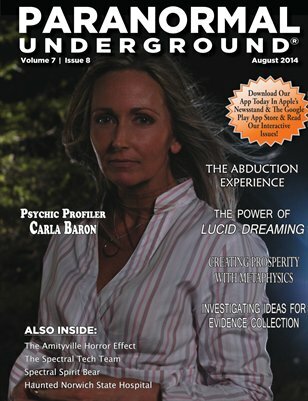 In this issue of Paranormal Underground magazine, we spotlight psychic profiler Carla Baron, investigative team Spectral Tech, and paranormal author Carrie Clevenger. We also feature the haunted Norwich State Hospital, abduction experiences, the spectral spirit bear, and the Amityville horror effect. Other columns discuss lucid dreaming, metaphysical techniques for prosperity, dream interpretation, and para-unity. For a PDF download or 12-month digital subscription to Paranormal Underground magazine, visit www.paranormalunderground.net! Or subscribe to our magazine via our apps on the Apple Newsstand (http://bit.ly/pumlink) and Google Play App Store (http://bit.ly/pugand)!